On this page you will find our selection of plain glass rectangle beads. They have rounded corners, so feel beautifully smooth against the skin. We have a great range of vibrant colours to suit any project. Full strand of pretty shaped glass beads. Approx. 33cm strand containing approx. 24 beads. 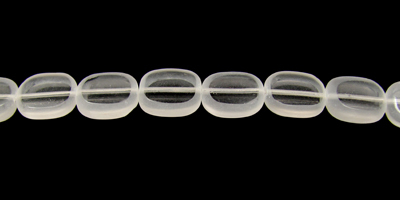 Full strand of glass rectangle shaped beads, with frosted edges. Full strand of pretty shaped glass beads. Approx. 33cm strand containing 24 beads. Full strand of mauve glass beads, lovely and shiny at a bargain price. Full strand of white glass beads, lovely and shiny at a bargain price.